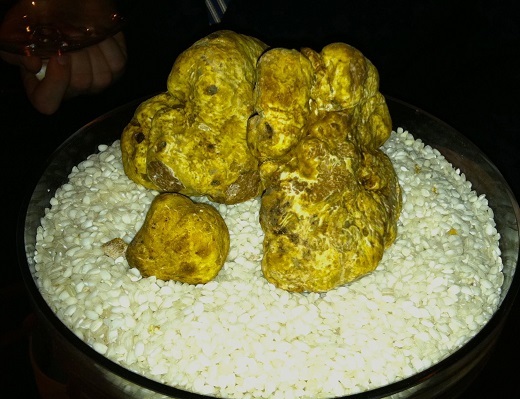 Del Posto’s Gattinara Room was the setting for my White Truffle Charity Dinner, an annual event that seems to have taken on a life of its own. This year’s dinner raised $45,000 for The Mount Sinai Hospital. 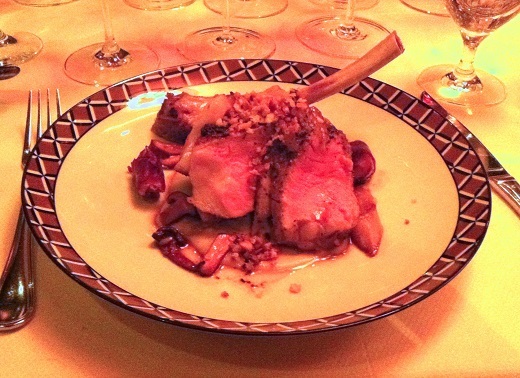 Executive Chef Mark Ladner and his team did a great job with the menu, which included some of my all-time Del Posto favorites such as the agnolotti, risotto, wood-grilled lobster and broiled veal chop. All of the courses were generously topped with white truffles, one of the truly profound pairings with Barolo and Barbaresco. Wine Director Jeff Porter took excellent care of our wines, never an easy job with this group. Readers may also want to take a look at the short video I shot just before dinner, as well as a companion video that includes my thoughts on some of the best wines from this magical evening of great food, wine and friendship. Bruno Giacosa’s 1969 Barbaresco has long been one of my favorite of his under the radar wines. The 1969 isn’t a blockbuster, but it always impresses for its overall balance, as it does again on this night. It is a wonderful wine that sets the stage for what follows. The 1970 Barbaresco Santo Stefano shows notable muscle and depth, with layers of dark, balsamic infused fruit and fabulous overall balance. The 1971 Barbaresco Montefico, from one of the all-time great Piedmont vintages, captures the pedigree of the year in its superb structure and delineation. Hints of pine, menthol and eucalyptus added complexity to the intense fruit. What a gorgeous wine! Four fabulous Dom Pérignons follow. The 1962 Dom Pérignon Oenothèque is insanely beautiful. Hints of lime, white flowers and crushed rocks linger on what seems like an eternal finish. This is a totally hypnotic Dom Pérignon. The 1964 Dom Pérignon Oenothèque (disgorged 1999) is quite a bit richer and deeper than the 1962, with more of a roasted, honeyed character that is striking in its beauty. The 1966 Dom Pérignon is now fully mature, but it is dazzling. Clean veins of minerality introduce an element of freshness to the notes of smoke, caramel and hazelnuts that develop in the glass. In most vintages I am a huge fan of the original release of DP. This bottle of the 1996 is stellar. I have always adored the 1975 Dom Pérignon Oenothèque for its silkiness and total finesse, qualities that are on full display tonight. The 1975 Oenothèque is rare and very expensive, but for those who seek and can afford the best, it is a must-have. Giacosa’s 1967 Barbaresco Riserva Asili has reached its peak. Although still a beautiful wine, it is starting to fray just a touch around the edges. All things considered it has held up beautifully. Most winemakers would be thrilled to have made such a gorgeous wine, but it is time to drink up. Readers fortunate enough to own the 1964 Barbaresco Riserva Santo Stefano are in for a real treat. The silkiness and supple, refined tannins support a highly expressive core of fruit in this stunningly beautiful, perfumed Barbaresco. The 1964 Santo Stefano remains one of the towering achievements in Bruno Giacosa’s stellar career. If I could only choose one Giacosa wine from the late 1960s and early 1970s to drink it would probably be the 1971 Barolo Riserva Speciale Rocche di Castiglione Falletto. It boasts remarkable depth and richness for a wine of its age, with plenty of 1971 structure and extraordinary balance. Layers of dark fruit saturate the palate on the intense, nuanced finish. 1978 Barolo Riserva Speciale Villero, an epic Barolo that captures all of the pedigree of this great vintage. Firm, classic 1978 tannins support massive fruit, spices, leather and licorice in this icon of Piedmont. Wow! What a showing. The 1996 Dom Pérignon Rosé is one of my all-time favorite Champagnes, but I have never tasted it this way, nor has anyone else in the room. Three bottles of the 1996 Rosé are lined up; a standard fifth, magnum and jeroboam. We are all quite curious to taste the three wines, as they were all released at different times. It is quite common for Champagne houses to vary the level of dosage according to the bottle size and release date, but DP is notoriously tight-lipped on such matters, so it is impossible to know for sure. The jeroboam is opened first. It is tight as a drum. Over the course of several hours, the wine opens up beautifully and by the end of the dinner it is clearly the most intriguing and complete of the three. I wish I owned more of these, but this is the last. The magnum is great right out of the gate. I adore the magnum format for all wines, but Champagne in particular. This is a fabulous showing. The straight fifth is also surprisingly closed at the outset, but then blossoms quickly. At the first tasting, it is the most impressive of the three bottles but as time passes there is much less development here than in the big bottles. What a fascinating comparative tasting. 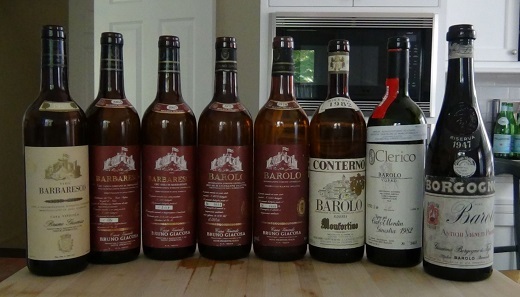 A small vertical of Giacosa’s legendary Barolo Collina Rionda follows. The most impressive vintage on this night is the 1982 Riserva, which captivates all of the intellectual and hedonistic senses with its striking perfume, fabulous length and stunning overall balance. The 1982 isn’t a huge Rionda, but it is arguably the most refined after the 1989. Another perfect bottle from a collection I purchased years ago. Thrilling. The 1978 Barolo Riserva Speciale Collina Rionda isn’t too far behind. This is a tremendous example of a legendary wine from one of the great all-time Piedmont vintages. While the 1982 won’t be at its peak forever, it appears that well-stored bottles of the 1978 might not have arrived yet! The 1989 Barolo Riserva Collina Rionda is strikingly beautiful and seductive, but, sadly, not quite the temptress it can be. Giacosa’s 1990 Barolo Riserva Collina Rionda, on the other hand is fabulous. I have had very mixed experiences with this wine over the years, but not tonight. The 1990 is rich, powerful and supple from start to finish. In other words, it is a pure-bred 1990. The 1971 Barolo Collina Rionda is the only wine of this evening that is flawed. It happens. Better here than elsewhere. The 1970 Barolo Collina Rionda is now fully mature, but is a gorgeous early example of Bruno Giacosa’s genius with this great site in Serralunga. Hints of autumn leaves, spices and worn-in leather linger on the delicate finish. The 1982 Conterno Barolo Riserva Monfortino, the last bottle from a lot I purchased some years ago, is drop-dead gorgeous. I have always loved the 1982s, and the Monfortino is one of the greatest wines of that year. Tonight, it is thrilling. I go back to the 1982 Giacosa Collina Rionda, from a gently sloping, hillside side, not too far from the Conterno family’s Cascina Franca. What a privilege it is to taste these two Serralunga icons next to each other. Domenico Clerico’ s 1982 Barolo Ciabot Mentin Ginestra more than holds its own in this flight of 1982s, which is high praise indeed. The wine is worth all of that admiration, and more. In the early 1980s Clerico worked with very rustic means. The wines were made in an outdoor shack outside Clerico’s house. The 1982 did is malolactic fermentation in used casks Clerico purchased from Aldo Conterno was aged in reconditioned beer barrels that were common in Piedmont at the time. But Ginestra is a great site, and aside from meticulous farming, it doesn’t need much, as this wine clearly attests. Still in fabulous shape, Clerico’s 1982 is a monument of the greatness of Barolo. Wow! The 1945 Musigny from Comtes de Vogüé is by far the most controversial wine of the night. It is of course beyond rare, and frightfully expensive. Is this bottle real? A fake? Reconditioned? It is impossible to tell for sure, but regardless, this is not a great bottle. For fun, I decide to open the 1947 Borgogno Barolo, a much, much humbler wine, but one I thought would be interesting to taste next to the de Vogüé. The Borgogno had one previous owner, and the condition of the bottle is remarkable. It isn’t a great wine, but there is a purity and frankness to the fruit that is striking in its beauty. A final taste the 1996 Dom Pérignon Rosé, from jeroboam, shows that wine to have a tremendous future. Readers who can find the jeroboams should absolutely not hesitate.